The significant majority of women do not take note of the change in Stages of menopause. One of the most common reasons for the change in menopause pattern is pregnancy. However, irregular periods are considered a red flag since it can be an evident sign iron deficiency or multiple pregnancies. Thus, when a lady recognizes a change in their periods, either a heavy or a lighter flow of blood, it is essential to take a blood test establish the cause of the change. When the change in period cycle accompanied by blood pressure, it could be a side effect of birth control pills or other medications. Painful periods could be an indication of a problem with the uterus, fibroids, cervical cancer, or uterine polyps. Thus, it is critical women always to check the condition of their periods, as it is a clear reflection of your health condition or a reaction to drugs or age. Stomach pains are some of the most common symptoms of problems with the abdomen. Though it could be just a simple indigestion problem, severe illnesses could be a sign of a more significant underlying problem. When the stomach pains become persistent and lead to bowel irritation, get medical attention from a doctor. 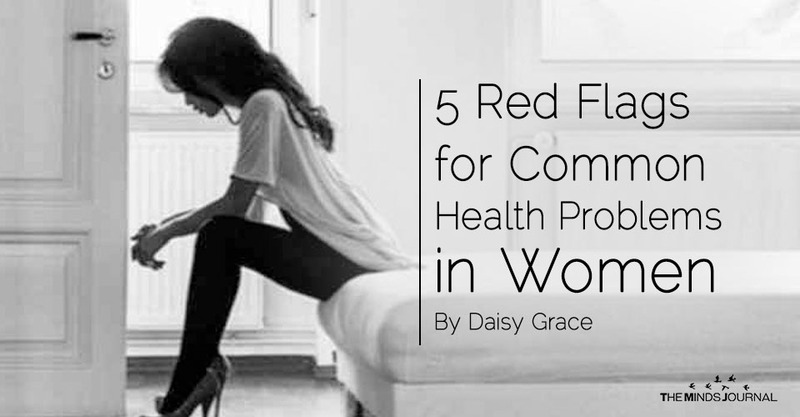 Here is why that is a red flag for women and why you need to get checked urgently. When a woman experiences a lower abdominal pain accompanied by a vaginal discharge that either green or yellow, plus pain in passing urine, just get checked. It could be an infection in the pelvis that could lead to infertility. Such pain could also be a sign of cervical cancer which is common to all women but most prevalent to women above the ages of 40. Upper abdomen problem especially after meals, which radiates to the back, could be a sign your pancreas is not well. On the other hand, when such pains are accompanied by vomiting, it could be a sign your gallbladder is not in excellent condition. When you have lower abdominal pains that transit to the thighs and an urge to pass water more frequently, it could be a clear indication of kidney stones get checked. Any pains in your abdomen deserve medical checkup and treatment. When the pains lead to weight loss and fatigue, it could a sign you have cancer that has not gone too far. When the strains cause difficulty in breathing a heart attack could be just around the corner.